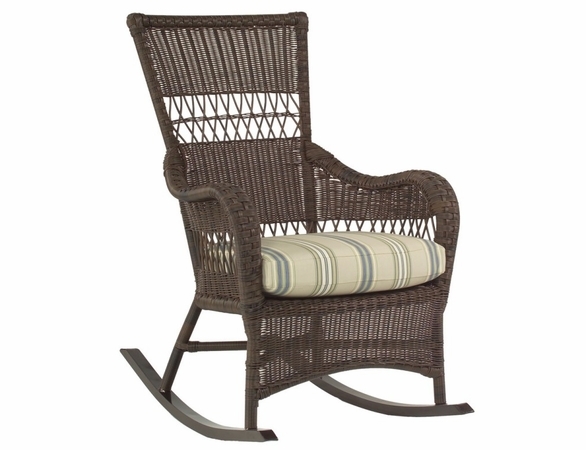 Our All Weather Wicker Sommerwind Rocker - Whitecraft by Woodard. 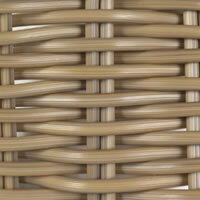 Available in Chocolate Weave (Shown Above), Pristine White or Natural/Round Weave. Shown in unavailable fabric. Note that Pristine White is a special order finish and will ship in 3-6 Months. 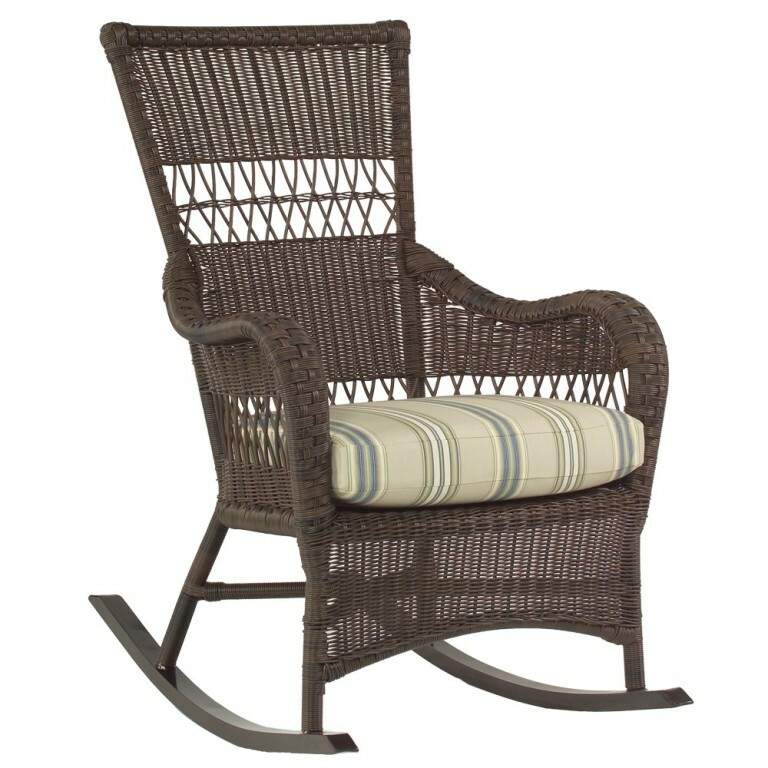 An all-around essential for your Victorian porch or English-inspired patio, the charming Woodard Sommerwind Wicker Rocker brings a classic feel to your outdoor seating set. 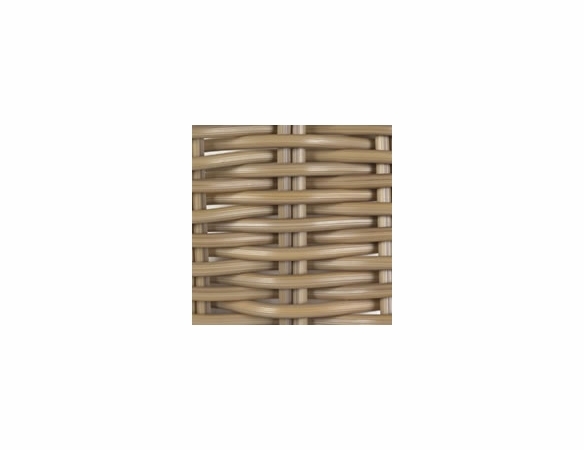 It offers the traditional look and silhouette of a wicker rocking chair but is constructed from HDPE weave that lasts significantly longer than traditional wicker. 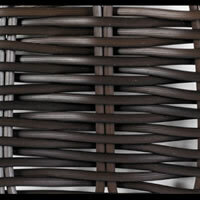 Woodard HDPE furniture won?t rot, crack, split, peel or fade and comes with a three-year manufacturer?s warranty. Outdoor Furniture Plus can help you customize this Woodard rocking chair to your tastes with your choice of finish, cushion fabric and optional welting. Don't see the fabric option you want? Give us a call. 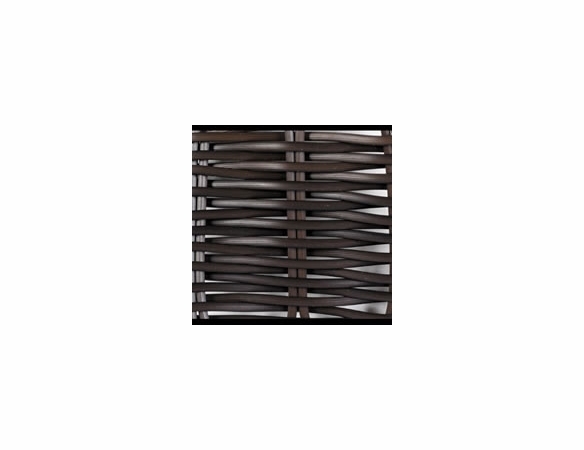 Even though we don't feature it above, we offer the full compliment of fabrics that are available through Woodard. What is welt? Welt is the small cording that is sewn into the cushion around the edge. *Many Other Woodard & Sunbrella Fabrics Available Upon Request. This items ships via Long Haul Trucking Company. Delivery via Truck requires an appointment for the driver to bring your order and will require someone to be there to sign the Bill of Lading. Your 3rd email from us will be a shipping notification letting you know that your order has �left the building�. At the bottom of the notification you will see the name of the trucking company delivering your order and the PRO number which is your tracking number. The phone number that you give us under the shipping information during checkout will be the number the shipping company will call to schedule the delivery. Or if you prefer, you can call the carrier direct to have more control over the delivery time. All you need is your PRO #. Our free shipping includes curbside delivery. If additional shipping services are needed such as white glove services, you can sometimes request that from the carrier when they call or from the driver if they have time. If you�d like to talk over your options, feel free to give us a call and we can share ideas of things other customers have done if they�ve needed help. If your order arrives damaged, please do not refuse it. Please accept your order BUT notate on the Bill of Lading that boxes were damaged. If you feel like it�s bad enough to take a peak before the carrier leaves, you have the right to do so. After opening your order, if there is any concealed damage, please give us a call and we can assist you to rectify the issue. Also, notate this on the Bill of Lading if the driver is still there.